To the joyful moments of the wedding ceremonyremember forever, the couple make photo and video. Fashion trend of 2016 is the use of the letters during the ceremony photoshoot. In many Western countries, the bride and groom with decorative signs create unique photos. These accessories will complement your photos, make photo shoot fun. Since they are now used as a wedding props, a lot of varieties. Which to choose the letters for a photo shoot for a wedding? For the photo shoot during the wedding using letters,by means of which subsequently created the word. As a rule, they laid out the initials of the newlyweds or the name completely, words and whole phrases of love. The process of preparing the decorative characters, inventing interesting phrases gives a lot of positive emotions. If you take the matter responsibly, will present fototeatr with his storyline. Consider the variety of decorative plates. Symbols made of foam popularfor the wedding photo shoot. They are made of any size and shape, because the data accessories are transported without any problems thanks to its light weight. Even the big, bulky accessories will be able to move in the right place, so if you are planning a photo shoot in the country, choose the foam plates. 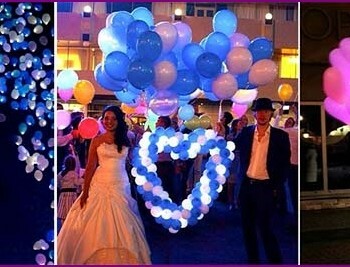 As for the design of weddingaccessories, they can be decorated with sequins, rhinestones, decorative foam. For a budget option, choose bright paint: it completely replaces the decoration and looks great on the wedding photos. As we can see, the foam product combines all the necessary qualities, so they usually choose as decorative elements to create a picture. Gypsum marks are more durable than foam. High-quality gypsum is immune to the adverse effects of environmental and mechanical damage. As a result, the risk of breakage is minimal letters during transport. In addition, they have a clear outline, so they are easy to read in the photographs. With gypsum accessories are made of various sizes and font. As a rule, their color - white, but there are exceptions. Flat characters are simply cut and then colored. Volume created using corrugated cardboard blanks, which are held together with tape. Make sure the cloth enough for all the characters. Choose a fabric with a colorful pattern, bright hue, in which case you make an extravagant picture. More characters are made using tissue, andand a cotton filler. In this case, accessories are more likely to resemble a soft toy than signs. Their huge advantage is considered to be low weight. 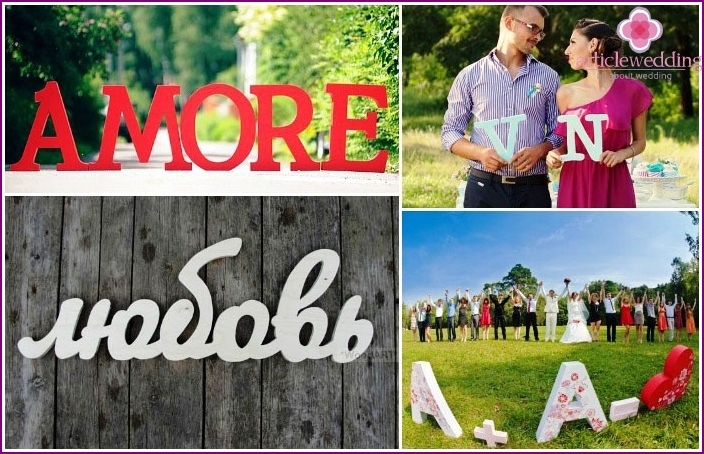 If you are wondering how to makeletters for a photo shoot with your hands, then keep in mind: There is nothing complicated to manufacture products for the wedding themselves. Foam and corrugated cardboard characters easily cut using a knife stationery, as well as the necessary materials. They subsequently glued over with a cloth or decorated with decorative elements. If you want to be photographed with the use ofgypsum accessories, it is best to order them from a specialist who deals with it professionally. Then you will get quality products for a wedding that perfectly complement your photos. Where to buy and the price? In modern bridal stores you canbuy letters for a professional photo shoot for a wedding. In addition, specialized agencies offer to purchase the whole inscription. 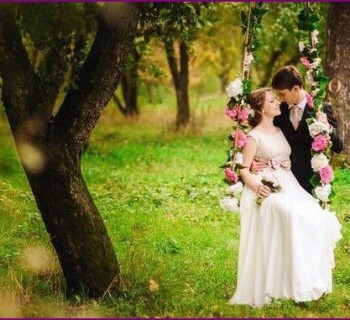 It's worth noting that the price of the labels for the wedding photo shoot are available - from 300 to 2000 rubles. This factor depends on the size, material, number of decorations on the product. A wide selection of letters, labels and ready-shapes can select accessories to wedding photography to taste. The letters at the wedding - it's a good way to keep the memory of an important event in the life of the newlyweds. Reviewing unusual photos, husband and wife are to resume in-memory priceless moments of your wedding. You know the other materials that are suitable to create accessories for the wedding? Share your ideas in the comments to the article!